The first time I had this was in a Persian restaurant in Washington DC. What an incredible idea: a salad of parsley. It’s a bit of a pain to make, especially since I don’t like parsley stems, but foolproof. 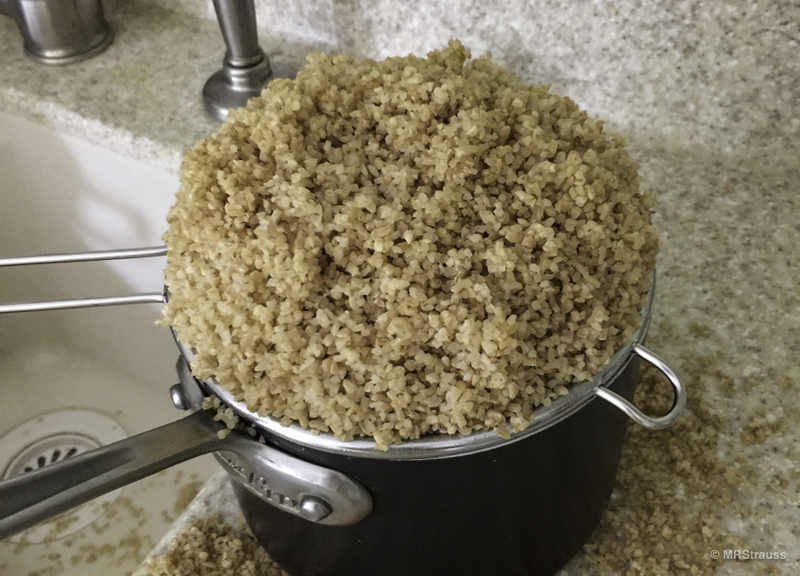 Start proofing the Bulgur wheat. There are many ways to do this. I’ve settled on putting it into a mesh strainer fitted into a saucepan—shown above—and running hot water over it to wet the grains until the water reaches the top. I sit it by the sink and about 45 minutes later it’s all puffed up and you can just pick the strainer up and let the water run out. While this is going on, get out a large bowl, the biggest one you have. Finely dice the tomatoes and put them in your bowl and sprinkle with the Maldon sea salt. Set aside. In a 2 cup measuring cup, add a half cup of olive oil and stir in the mint; finely minced if using fresh. Squeeze the lemons and add to the olive oil. Now finely dice the red onion and add it to the olive oil and lemon juice mixture. Now the parsley. I don’t like stems so I painstakingly pluck the leaves and then coarsely chop them. But you can do this however you want. 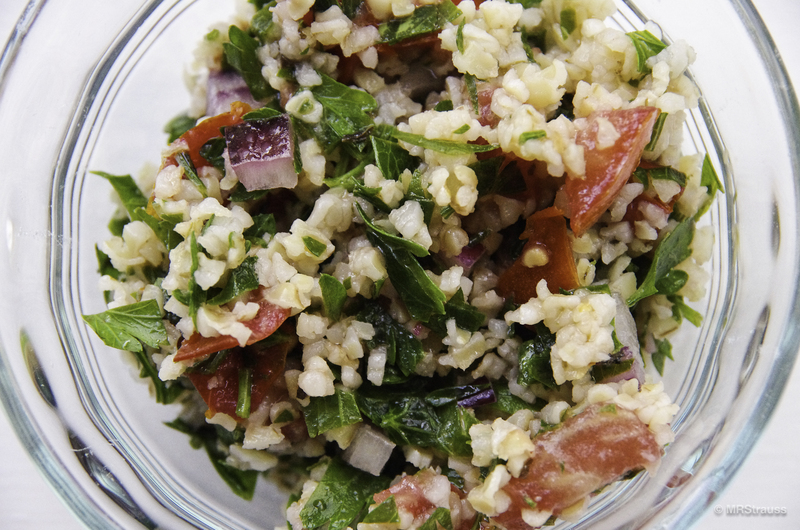 Once the bulgur is drained and ready, add everything to the bowl with the tomatoes. Add freshly ground pepper to taste or not. Watch it disappear in less time than it took to make. This entry was posted in Bentosh and tagged Parsley, Summer, Tabbouleh, Tomatoes on August 18, 2017 by mrstrauss. © MRStrauss and Lostonearth.info, 2011-2019. Unauthorized use and/or duplication of this material without express and written permission from this blog’s author and/or owner is strictly prohibited. Excerpts and links may be used, provided that full and clear credit is given to MRStrauss and Lostonearth.info with appropriate and specific direction to the original content.